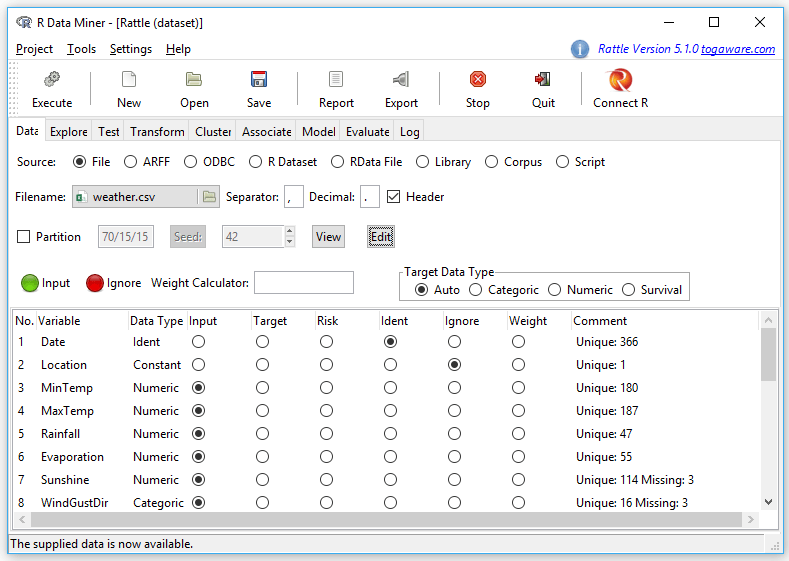 Rattle is a popular free and open source Graphical User Interface (GUI) for the R software, one that focuses on beginners looking to point-and-click their way through data mining tasks. Such tasks are also referred to as machine learning or predictive analytics. Rattle’s name is an acronym for “R Analytical Tool To Learn Easily.” Rattle is available on Windows, Mac, and Linux systems. Figure 1. 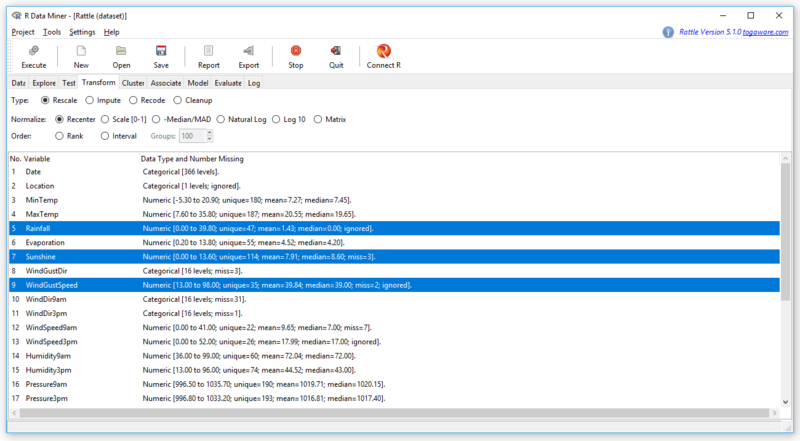 The Rattle interface with the “Data” tab chosen, showing which file I’m reading, and the roles of the variables will play in analyses. The role assigned to each variable is critically important. Note the all-important “Execute” button in the upper left of the screen. Nothing happens until it’s clicked. 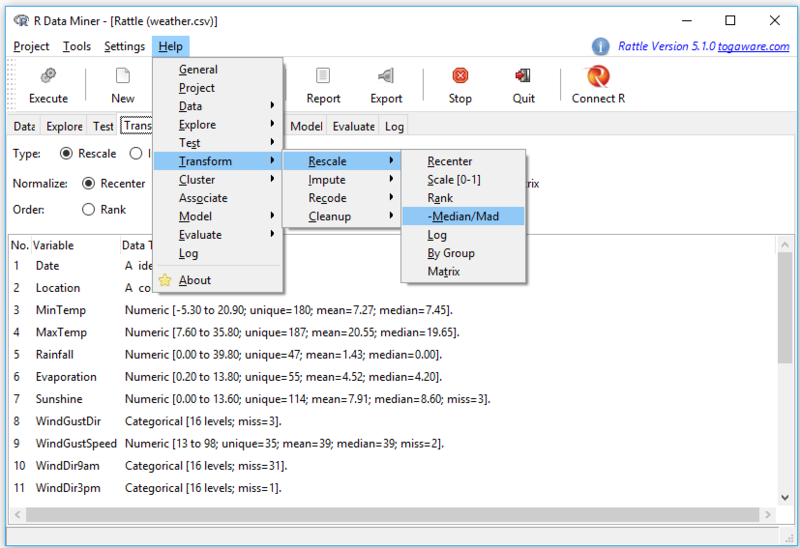 Rattle’s data editor is unique for a GUI in that it does not offer a way to create a data set. It lets you edit any data set you open using R’s built-in edit function, but that function offers very few features. Clicking on a variable name will cause a dialog to open, offering to change the variable’s name or type as numeric or character (see Figure 2). Rattle automatically converts variables that have fewer than 10 values into “categorical” ones. R would call these factors. You can always recode variables from numeric to categorical (or vice versa) in the “Transform” tab (see Data Management section). Figure 2. Rattle uses R’s built-in edit function as its data editor. 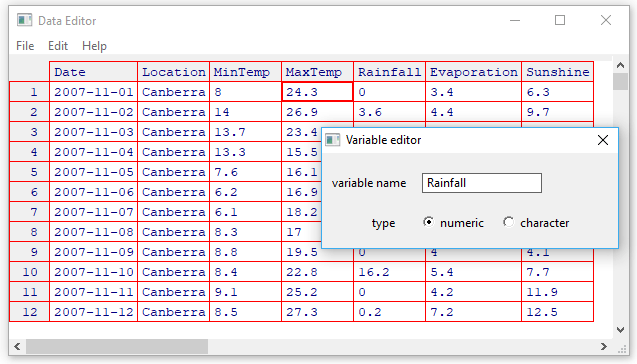 Here I clicked on the name of the variable “Rainfall” to show how you might rename it or change its data type. Rattle skips many common statistical data formats, but it includes a couple exclusive ones, such as the Attribute-Relation File Format used by other data mining tools. It also includes “corpus” which reads in text documents, and it then it performs the popular tf-idf calculation to prepare them for analysis using the other numerically-based analysis methods. Whenever a variable is transformed, its status in the “Data” tab switches from “Input” to “Ignore”, while the transformed version of variable enters the data with an “Input” role. Figure 3. Rattle’s “Transform” tab with three variables selected. The “Recode” sub-tab is also selected and the “Recenter” transformation is chosen. When the “Explore” button is clicked, the newly tranformed variables will be appended to the data set with a prefix indicating the type of transformation performed. Rattle uses an entirely unique user interface, one that differs from all the other GUIs covered in this series of reviews. Much of the time I found this interface very easy to use, but for some tasks the novelty of its style had me stumped for quite a while. As you can see in Figure 1, Rattle has a set of tabs across the top, similar to Microsoft Office or a browser with several windows open. Their order of appearance from left to right mirrors the steps you follow when analyzing data. First you have to read “Data”, then you “Explore” it, decide how to “Transform” it, and then choose from one of three general types of analyses: “Cluster” observations (i.e. find groups with no variable to predict), “Associate” values (i.e. study co-occurrences), “Model” predictions (i.e. predict the value of a measurement, or predict membership in a group). Then you “Evaluate” your models, comparing them to choose the best. Finally, if you want to learn R programming, the “Log” will show you how Rattle performed all its steps. At each step, you must configure the tab’s settings and press the “Execute” button (or F2) before the settings will have any effect. Rattle intercepts some messages from R and shows them to you, but some of them end up in the R console that you used to start Rattle. So it’s best to have that window in sight at all times. The variable roles that you set in the “Data” tab determine what’s possible in all the other tabs. Setting the “target” variable (a.k.a. dependent variable), the “input” variables (independent variables), and the variables to “ignore” will maintain those roles on all the following steps in the analysis. If you change those roles, don’t forget to click the “Execute” button to effect the changes! 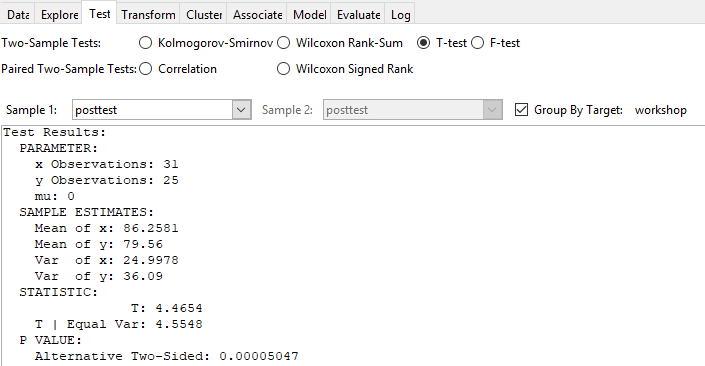 Statistical tests are all performed under the “Test” tab (see Figure 4). There you choose a test with a radio button, then choose one continuous variable in the “Sample 1” menu, and check the “Group By Target:” box. For paired samples, you can enter the second continuous variable in the “Sample 2” box, but note that the T-test performs only the independent samples test! Figure 4. The “Test” tab showing how statistical tests are controlled. A common form of analysis, cross-tabulation, is located under “Explore> Summary> Crosstab”. Running it will cause all the categorical variables to be cross-tabulated with the target variable. There is no way to directly request a cross-tabulation of just two variables as there is in every other GUI covered in this series of reviews. To change which variables are used in cross-tabulations, you could tell Rattle to “ignore” more variables on the “Data” tab, or use “Transform> Recode> As Categoric” to determine which to view as categorical since only that type will be used. The “Log” tab shows that the CrossTable function from the gmodels package is used to create the cross-tabulations. That function can calculate a chi-squared test which is commonly done for such tables, but the GUI offers no way to make that happen. You would have to learn how to modify the code, copy it to your R console, then submit it to get that test. Many of your dialog box settings are saved when you choose “Project> Save as.” That creates a file with the extension of “.rattle”. Projects save all your settings, models, and graphs. Rattle is documented extensively in Graham William’s book Data Mining with Rattle and R. I review that excellent book here. There are over 1,400 videos on YouTube showing how to accomplish many different tasks using Rattle. Figure 5. Rattle’s help menu. Rattle’s help menu is shown in Figure 5. It offers help for each tab, and for those tabs that include sub-tabs, another menu pops out the side. In Figure 5, I clicked on “Help”, then pointed at “Transform.” The sub-menu appeared and I pointed at “Rescale” then, “-Median/Mad.” A help box popped up saying this choice will subtract the median from the original variable, then divide by the Median Absolute Deviation (MAD), which it also defined. Rattle uses no custom functions [is this correct? ], so the only remaining level of help needed is for the R functions themselves. The R functions used are defined at the end of many help files (some are perfectly clear as is) and it asks if you’d like Rattle to show you R’s original help file on those functions. The various GUIs available for R handle graphics in several ways. Some, such as RKWard, focus on R’s built-in graphics. Others, such as BlueSky Statistics, focus more on graphics done by the popular ggplot2 package. GUIs also differ quite a lot in how they control the style of the graphs they generate. Ideally, you could set the style once, and then all graphs would follow it. That’s how jamovi works, but then jamovi is limited to its custom graph functions, as nice as they may be. Rattle uses a wide variety of packages to create graphics (e.g. Figure 6), so their appearance differs and there is no way to standardize their style within Rattle. You could use R code to change their look or style by editing the R code in the “Log” tab and submitting it in an R console. Rattle doesn’t include a graphic display window, so the graphs appear in window provided by the R software that you use to start Rattle. Figure 6. 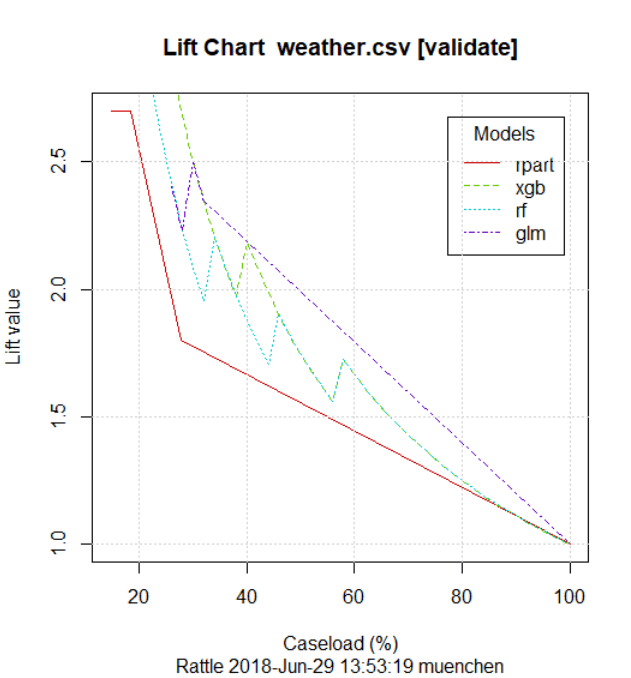 Lift chart comparing four predictive models. Note that there is no “Graphics” menu as nearly all the other GUIs offer. Rattle’s graphics are done within the analysis steps (jamovi uses this approach too). The exception this comes from its unique integration with the ggraptR software. 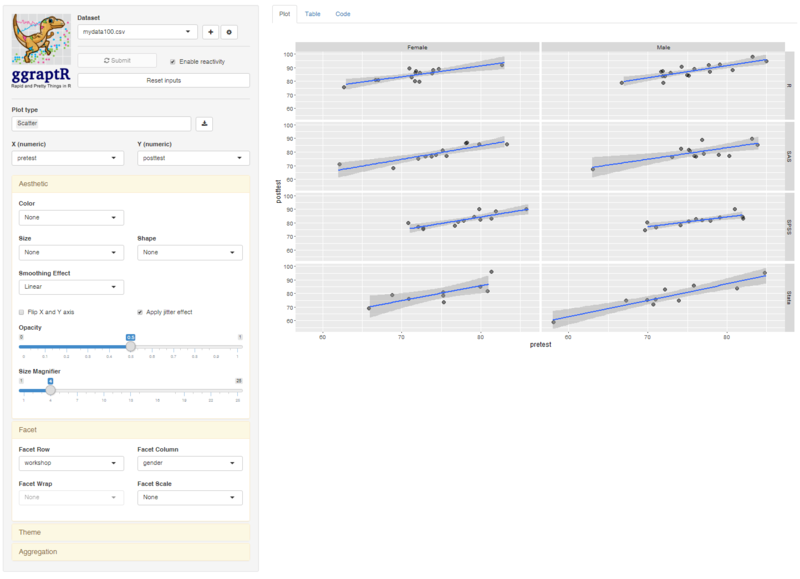 That application that allows you to create complex plots interactively using the ggplot2 package. Choosing “Explore> Interactive> GGRaptR” displays the the interface shown in Figure 7. This application is nearly as powerful as Deducer’s Plot Builder plug-in, missing only the ability to add additional layers to a plot (e.g. jittered points on top of a boxplot). Figure 7. The ggraptR web site with my data set autmatically transferred by Rattle. I made the graph with just a few clicks of the mouse. A more interactive style of plot is available under “Explore> Interactive> GGobi.” GGobi offers scatterplots, bar charts, parallel coordinate plots, and projection pursuit tours, all with multiple linked windows and brushing which lets you identify points in one plot and highlight the selection in all plots. The way statistical models (which R stores in “model objects") are created and used, is an area on which R GUIs differ the most. The simplest, and least flexible approach, is taken by jamovi and RKWard. They try to do everything you might need in a single dialog box. They either don’t save models, or they do nothing with them. To an R programmer, that sounds extreme, since R does a lot with model objects. However, neither SAS nor SPSS were able to save models for their first 35 years of existence, so each approach has its merits. Other GUIs, such as the R Commander or Bluesky Statistics let you save models and have other dialog boxes that let you do a variety of additional tasks with them. Rattle creates models within an interactive session and during that session it can do various things with them. For example, “Evaluate> Lift” created the plot shown in Figure 5. You can also use “Evaluate> Score” to open a new data set and use all the models you chose (via check-boxes) to make predictions. The models are saved when you save a project. An important limitation to be aware of is that Rattle’s modeling does not allow you to control model formulas. For example, if you wanted to add an interaction term in a linear regression, you would have to copy the code from the “Log” tab to the R console of your choosing, add the model formula you wanted, then execute it. Once outside the Rattle environment, you would not be able to use the tools on its “Evaluate” tab to compare that model to others. One of the aspects that most differentiates the various GUIs for R is the code they generate. If you decide you want to save code, what type of code is best for you? The base R code as provided by the R Commander which can teach you “classic" R? The “tidyverse” code often used by BlueSky Statistics? The concise functions that mimic the simplicity of one-step dialogs such as jamovi provides? The completely transparent (and complex) code provided by RKWard, which might be the best for budding R power users? Rattle uses classic R code, rarely using newer tools such as the tidyverse packages. Since Rattle is focused on data mining, you might expect it to take advantage of newer packages in that area, such as caret or mlr, but it doesn’t. The developer does plan to use such packages in future versions of Rattle. Rattle works as an adjunct to R IDEs, so it doesn’t include any support for submitting its own code. It will, however, allow you to edit its “Log” in a simple text editor before saving it or pasting it into an IDE. While Rattle’s project files will save which data set you’re working on, and the roles of each variable, they don’t save anything else. So full reproducibility of your work in Rattle requires saving the R code that it creates and stores in its “Log” tab. There’s no way to get back to re-populate all the tab settings when starting from the saved code. If you wish to share your work with a colleague, you would send them your project file and your data set. You could also save the contents of the “Log” tab and send them the complete R code, since running that is the only way they’ll see a cumulative output file (See Output & Report Writing below). Since Rattle contains few custom functions, there’s a good chance they could run your code directly. However, it would be wise for them to install the rattle package for the few custom functions, such as the popular decision tree viewer, fancyRpartPlot. As soon as you click the Execute button (or F2), the output from your chosen analysis appears in the bottom of Rattle’s main control screen. It’s R’s standard monospaced output with no additional formatting. As you do each task, Rattle replaces the contents of the output window rather than append it to the bottom of the previous output as is usually the case in other R GUIs. If you want a cumulative report, you have to cut and paste it into a word processor as you go, or save the R code from the “Log” tab to execute in the R console of your choosing. Repeating an analysis on different groups of observations is a core task in data science. Software needs to provide an ability to select a subset one group to analyze, then another subset to compare it to. Of the six GUIs for R reviewed in this series, Rattle was the only one that lacked this fundamental ability. You would have to use R code or some other tool to break your data into subsets before reading each into Rattle one at a time. Software also needs the ability to automate such selections so that you might generate dozens of analyses, one group at a time. While this has been available in commercial GUIs for decades (e.g. SPSS split-file), Rattle does not offer it. Of the GUIs reviewed, BlueSky Statistics offers it. Rattle offers only observation-level output management, and even then it is limited to predicted values or predicted group membership. You can provide feedback and request new features at this web site. However, there is not an easy way to write your own plug-ins to Rattle as there is for many of the other GUIs reviewed in this series. As a tool to get users started with R and data mining / machine learning, Rattle is easy to learn and quick to use. For an introductory class on data mining or machine learning, using it would allow the class to focus on learning the field rather than learning how to use software. People wanting to move beyond pointing-and-clicking will find Rattle provides extremely well-documented code to learn from. While there are several R GUIs that offer more statistical methods than Rattle, only two of them offer a similar range of data mining tools. The R Commander has a plug-in named RcmdrPlugin.OptimClassifier that offers many of Rattle’s methods. BlueSky Statistics also offers a similar set of methods, and it can optimize them via the caret package. Both of those packages offer much more comprehensive coverage of both data management and statistical methods. However, only Rattle includes interactive visualization via GGobi, and it comes with an extensive a set of graphics focused on comparing multiple models. Rattle is the second most popular R GUI overall, and its use has been growing steadily since its introduction. If data mining is your area, or you’re wanting to get started in it, I recommend giving Rattle a try! Thanks to Graham Williams for the hard work that went into creating Rattle, and for making it freely available to all. Graham also made many suggestions that improved this article. Thanks also to Rachel Ladd, Ruben Ortiz, Christina Peterson, and Josh Price for their editorial suggestions.